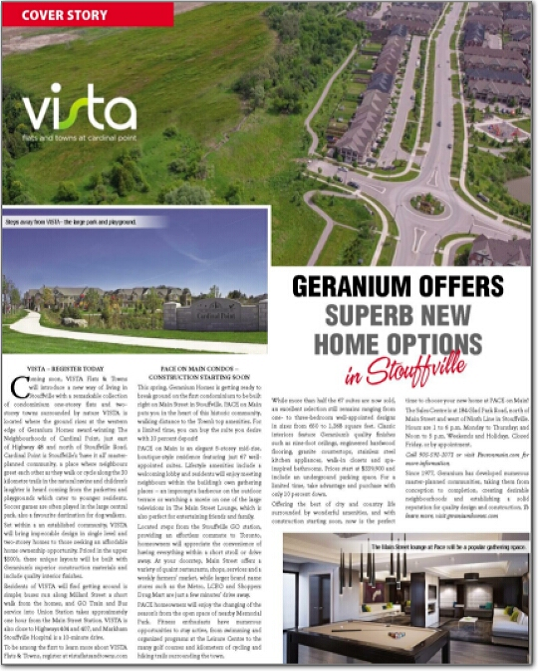 Coming soon, VISTA Flats & Towns will introduce a new way of living in Stouffville with a remarkable collection of condominium one-storey flats and two-storey towns surrounded by nature VISTA is located where the ground rises at the western edge of Geranium Homes award-winning The Neighbourhoods of Cardinal Point, just east of Highway 48 and north of Stouffville Road. Cardinal Point is Stouffville’s ‘have it all’ masterplanned community, a place where neighbours greet each other as they walk or cycle along the 30 kilometre trails in the natural ravine and children’s laughter is heard coming from the parkettes and playgrounds which cater to younger residents. Soccer games are often played in the large central park, also a favourite destination for dog walkers. Set within a an established community, VISTA will bring impeccable design in single level and two-storey homes to those seeking an affordable home ownership opportunity. Priced in the upper $300’s, these unique layouts will be built with Geranium’s superior construction materials and include quality interior finishes. Residents of VISTA will find getting around is simple; buses run along Millard Street a short walk from the homes, and GO Train and Bus service into Union Station takes approximately one hour from the Main Street Station. VISTA is also close to Highways 404 and 407, and Markham Stouffville Hospital is a 10-minute drive. 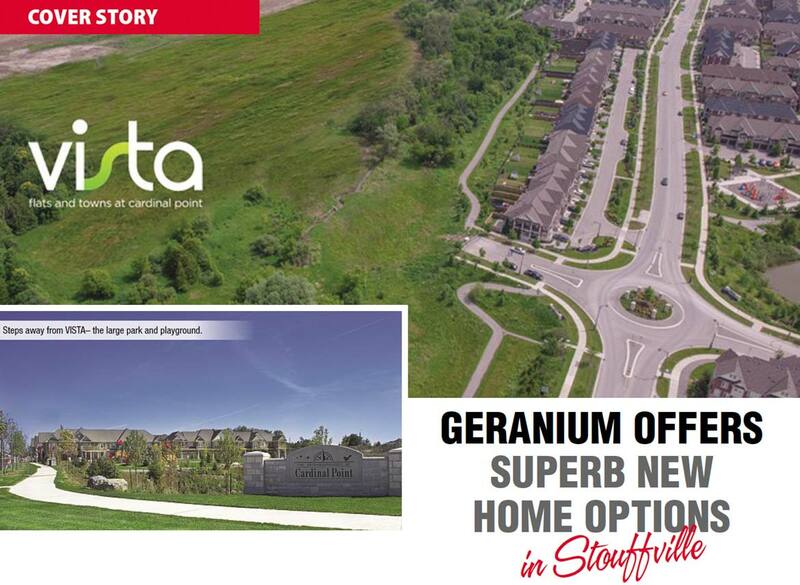 This spring, Geranium Homes is getting ready to break ground on the first condominium to be built right on Main Street in Stouffville. PACE on Main puts you in the heart of this historic community, walking distance to the Town’s top amenities. For a limited time, you can buy the suite you desire with 10 percent deposit! 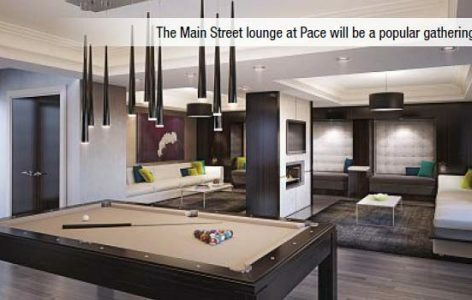 PACE on Main is an elegant 5-storey mid-rise, boutique-style residence featuring just 67 well appointed suites. Lifestyle amenities include a welcoming lobby and residents will enjoy meeting neighbours within the building’s own gathering places – an impromptu barbecue on the outdoor terrace or watching a movie on one of the large televisions in The Main Street Lounge, which is also perfect for entertaining friends and family. Located steps from the Stouffville GO station, providing an effortless commute to Toronto, homeowners will appreciate the convenience of having everything within a short stroll or drive away. At your doorstep, Main Street offers a variety of quaint restaurants, shops, services and a weekly farmers’ market, while larger brand name stores such as the Metro, LCBO and Shoppers Drug Mart are just a few minutes’ drive away. at the Leisure Centre to the many golf courses and kilometers of cycling and hiking trails surrounding the town. While more than half the 67 suites are now sold, an excellent selection still remains ranging from one- to three-bedroom well-appointed designs in sizes from 650 to 1,368 square feet. Classic interiors feature Geranium’s quality finishes such as nine-foot ceilings, engineered hardwood flooring, granite countertops, stainless steel kitchen appliances, walk-in closets and spa-inspired bathrooms. Prices start at $339,900 and include an underground parking space. For a limited time, take advantage and purchase with only 10 percent down. wonderful amenities, and with construction starting soon, now is the perfect time to choose your new home at PACE on Main! The Sales Centre is at 184 Glad Park Road, north of Main Street and west of Ninth Line in Stouffville. Hours are 1 to 6 p.m. Monday to Thursday; and Noon to 5 p.m. Weekends and Holidays. Closed Friday, or by appointment. Call 905-591-1071 or visit Paceonmain.com for more information.